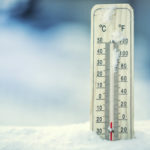 132406481 – Thermometer on snow shows low temperatures under zero. Low temperatures in degrees Celsius and fahrenheit. Cold winter weather twenty under zero.